Milhaud’s Les Choéphores op. 24 (The Libation Bearers) is a strange work. Written between 1913 and 1915, it is Part II of a trilogy on the Agamemnon-Electra-Orestes story, framed by Agamemnon op. 14 (1913-1914) and Les Euménides op. 41 (whose composition was begun in 1917 and completed only in 1924). Agamemnon and Les Choéphores are in fact the incidental music (“musique de scène”) for the plays adapted by the famous French poet and playwright Paul Claudel from the two first tragedies of Aeschylus’ Oresteia, while Les Euménides is a fully-fledged, three-act opera. Les Choéphores deals with the Electra story, the same episode put to music by Strauss. Milhaud was a young composer of 21 when he began work in 1913, but his typical style is fully there already, the vocal writing very declamatory and closely modeled after the rhythm of the spoken language but with some occasional twists, the bizarre and grating polytonal harmonies. 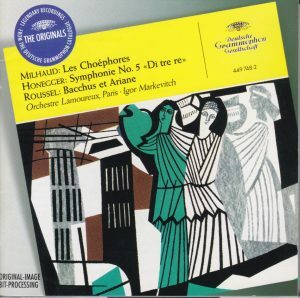 The incidental music of Les Choéphores starts with a “funeral vociferation” (translated here by “lamentation”, which waters down the original meaning), and the words are pretty dramatic (“On my cheek the crimson glow / Doth shine, that hands have printed fresh / With furrowing nails on tender flesh”) but with Milhaud it sounds like a hymn of joy. Masochist libation bearers maybe. Jest apart, the music is interesting here at least for this unsentimental approach, this very contradiction between words and music. Still, Milhaud certainly doesn’t appear in Les Choéphores as a natural-born melodist, although, getting used to the composer’s particular style, at least you recognize familiar Milhaud, to the hilt. But Choéphores does stand out for its moments of fine lamenting pathos (track 2 “Libation”, soprano over wordless chorus) and for its powerful incantations (track 3). But above all, Les Choéphores features three extraordinary passages of powerful and violent Sprechgesang (spoken, rhythmically notated) over percussion accompaniment and chorus singing onomatopeia, and at times even blowing whistles (track 4 “Présages” / “Omens”, 5 “Exhortation” and the short “Conclusion”, track 7). This is Carl Orff (and Orff’s Antigonae especially comes to mind, see my review of Inge Borkh and Ferdinand Leitner’s reference recording, DG 437 721-2) decades before Carl Orff “invented” (or copied from Milhaud?) the typical Carl Orff style, and really here Milhaud is decades ahead of his time. For reasons unknown to me (but which might have had to do with this very radicalism), there elapsed a long period of time between composition and premiere performance of each part of the trilogy: almost fifteen years for Agamemnon, premiered in 1927 (with the Straram Orchestra under its founder Walter Straram). Only excerpts of Choéphores were played in 1919 under Felix Delgrange, and the first staged performance happened in Brussels in 1935. Only the finale of Euménides was performed in 1928 under Louis de Vocht, the first complete performance took place only in 1949 in Brussels under Frans André. The first stage performance of the complete trilogy took place at the Berlin Deutsche Oper in April 1963 under Heinrich Hollreiser. All this information comes from the website of Bibliothèque Nationale de France. Not that Choéphores is a frequent encounter on disc either – in fact, I am aware of only two recordings, this one by Markevitch in 1957 and Bernstein in 1961, CD reissued on Sony Masterworks Heritage MHK 62352 (with Roussel’s Third Symphony and Honegger’s Pacific 231 and Rugby), and thereafter everybody apparently considered that the deed had been done and enough tribute had been paid to Milhaud’s composition – but at least it has been recorded; never so with the two other pendants of the trilogy. I heard the complete cycle once on the French radio (I probably have a tape of it somewhere in my cellar, surely demagnetized by now), and the two others didn’t sound stylistically inferior or even different from Les Choéphores. It’d be nice if someone completed the task and recorded the complete cycle. Hello, Timpani, anybody listening? Markevitch conducts with consumate style and a fine group of singers (Swiss baritone Heinz Rehfuss sings with perfect French accent, and traces of strain in the upper registers), if stylistically smacking of a bygone era of French opera and declamation, and speaker Claude Nollier (that’s a she) acquits herself magnificently, with great dramatic impact, of the Sprechgesang passages. But whatever its merits, Markevitch’s version suffers from its antiquated mono sonics (RCA and even EMI recorded in stereo since 1955, but not DG apparently, or at least not DG-France) that lack impact and let many orchestral details blurred and inaudible (especially lamentable with the percussion accompanniment in the Sprechgesang movements), and makes the chorus close to unintellegible if you are not following with the printed text. Bernstein’s American chorus, singers and speaker may not have as perfect a French accent as Markevitch forces, but, for Americans, their French accents are fine enough (except for McHenry Boatwright singing Orestes) and only French-fluently-speaking listeners will perceive and may be bothered by the americanisms; Bernstein conducts a fine performance also, if not as taut and urgent and biting as Markevitch’s, and his cast of singers may not be as good as Markevitch’s (Irene Jordan sounds like a powerful dramatic soprano but her bottom range is very chesty, and so is contralto Virginia Babikian, and Boatwright has a big and firm voice, but none of the nobility of Rehfuss), but it is really Bernstein’s 1961 Columbia sonics that make a world of difference, between a vivid sonic experience and a mere document. However, one asset of Markevitch’s-DG’s edition over Sony-Bernstein’s is that it provides the much-needed original text with English translation – Sony only offers a synopsis, which in the case of this very peculiar composition is as good as nothing. And if you find Lewis Campbell’s English somewhat pompous, don’t worry – it is only being faithful to the style of Claudel. The translation is not always entirely accurate, but Claudel’s very peculiar poetic style, a mixture of the highfalutin and the prosaic, is close to untranslatable, and Campbell provides a close enough idea. 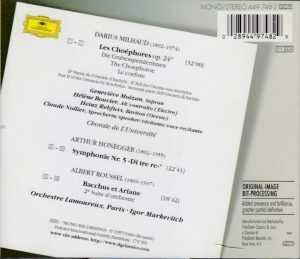 Honeggger’s 5th Symphony was the generous filler of Markevitch’s Choéphores on the original LP (reproduction of cover photo provided). It’s a fine performance, very close in spirit and interpretive choices to Munch’s pionerring 1952 recording with the BSO in the first two movements (CD reissued on RCA GD60685 with Honegger’s Second Symphony and more Milhaud) and even slightly more urgent than him in the Finale, but hampered again by sonics that let some important instrumental details get buried in the first movement (like the ominous trumpets in the build-up to movement’s climax, from 3:26 onwards), and deprives the grim and aggressive music of the Finale of much impact. Munch has much more clarity, transparency and impact. In fact compared to RCA’s transfer for Munch, DG’s sonics sound like they date from 1952 and those of Munch from 1957. I’ll return later to Roussel’s 2nd Suite from Bacchus & Ariane, a recording from December 1958, originally paired with Debussy’s La Mer. Independent even of it, this “Originals” edition is a great document for collectors, but for listeners simply looking for great versions of the respective compositions, the sonics are a real impediment and they should go to Bernstein’s version for Milhaud (a generous offering, with arguably the best recordings of Honegger’s Pacific 231 and Rugby, and Roussel’s Third Symphony), and to the best stereo recordings for Honegger’s 5th Symphony, those of Serge Baudo, part of his fine traversal of the complete symphonies recorded between 1960 and 1973 with the Czech Philharmonic Orchestra for Supraphon (but also available individually on Supraphon Crytal 11 0667-2 with Symphony No. 3 “Liturgique“, Pacific 231, Pastorale d’été and Chant de Joie, details in the review), Charles Dutoit on Erato, an excellent version lacking only the touch of rawness and brutality the works require, or one of the great Honegger discs of all times, Neeme Järvi on Chandos CHAN 9176 (with Symphony Liturgique and Pacific 231).